Yesterday I listened to an interview with Frank Viola and George Barna about their book Pagan Christianity?. I keep thinking of the former pitcher for the Red Sox. You have to really have your head in the sand to not notice all the books critical of the “institutional church”. This is a phrase that was used ad infintinum during the 70-minute interview. Never defined. Here’s my beef with the beef against the institutional church. Actually I have a few beefs. 1. Overgeneralization. Yes, many of the criticisms are true of many churches. But none of the criticisms is true of all churches. So you end up throwing out the baby with the bathwater. Yes, for instance, many churches are all about buildings (I could tell you stories, baby). But not all are. And that includes some big, famous congregations. For instance, Redeemer PCA in NYC does not have a building. They continue to rent facilities. But sometimes owning your facility is a good thing. Rent was one of the problems we ran into in our restart. If we had put our money into a new facility on a visible piece of land we might have done better. I don’t know, and never will. But buildings alone are not the issue- but the attitude about buildings. 2. Lack of Personal Responsibility. They blame the church, not themselves. Yes, there are some dysfunctional churches, and churches that enable spiritual slackers. But most churches I’ve been associated with want people to grow and be involved. Most people who are not engaged are not engaged because they don’t want to be engaged. Those people fail to take personal initiative to build relationships with others, allow others into their lives, go to small groups and the list goes on. It is easy to make the “institutional church” the scapegoat. The larger the church the more effort you may have to put into getting to know people. But I’ve been in churches of over 1,000 and been able to make friends and build relationships that lasted longer than my time there. Am I special? No! I recognized my personal responsibility instead of expecting everyone to initiate contact with me. Most churches nearly beg people to be involved, they aren’t wanting to have a congregation of spectators. As you can imagine, I’ve gotten plenty of rejection letters in the last few years. In fact I’ve gotten 3 this week. Some of them have really annoyed me because they made some faulty assumptions about me, some of which were refuted in my resume & data form. This one, however, made me laugh. It was a nice way to deliver bad news. negligent, careless, or slow in performing one’s duty, business, etc. : He’s terribly remiss in his work. 2. characterized by negligence or carelessness. I am writing on behalf of our search committee and apologizing for my personal remiss behavior in not writing you sooner. This really was a good way to communicate not so great news. They obviously hadn’t read my advice to search committees and failed to keep people up to date (beyond the initial recognition of my application). I’m glad they didn’t persist, but let me know their search is complete and God provided a godly pastor for them. I came across The Gospel According to the Old Testament series some time ago. I’ve picked up new books when they have come out. I think I have most of the series, and hope to use them at some point for a sermon series or teaching series. But I haven’t read one in a few years as other matters distracted me. But yesterday I was showing them to a friend who hadn’t heard of them. So I decided now was the time to resume some of my reading. I had read some of Living in the Gap Between Promise and Reality: The Gospel According to Abraham by Iain Duguid for some earlier sermons. I picked up where I left off. Let me say that I met Dr. Duguid last June. He left Westminster West to teach at Grove City College. In the process he transferred to the ARP with hopes of planting a church near the college. He seems like a stand up guy. In the gap between promise and reality, we find Abraham failing in Egypt. I like what Duguid has to say about failure for Christians. Now, in this chapter, we will see- not for the last time- faith dealing with that failure. That’s a very important lesson for us to learn, isn’t it? There seem to be plenty of books telling you how to be a success, but few write about what to do when you find that you aren’t. Yet what you do when you are at your lowest ebb, when everything has gone wrong and you have failed God and your neighbor utterly, says a great deal about the kind of person you are and the kind of faith you have. Thankfully the Bible is about real life, and how faith engages real life. God knows we all fail and made sure we hear about how other faithful followers have gotten up, dusted themselves off (by the blood of Christ) and kept going (by the grace of God). This is encouraging to me. I need to hear this. Does failure drive you away from God, or does it drive you back to square one, back to where you started, back to the altar, the place of sacrifice, so that you can call on the name of the Lord? The builders of the Tower of Babel made no room for offering sacrifices to God and calling on the name of the Lord. Their motto was “In man we trust.” For that reason, when their building project fell apart, so did they. They had no means of dealing with failure. There was no room in their hearts for repentance, and consequently their religiousity could not survive the exposure of their own inadequacy. Have you met those guys? I have. It is not pretty. By God’s grace I’m not one of them. I’m pretty inadequate. As Paul told the Corinthians, any competency I have comes from God. That’s true for all of us, but not all of us realize it. So, failure means you are a failure. I heard a great line about Isiah Thomas when he was FINALLY fired- “putting the ‘L’ in losing since 200_”. I joke with CavWife that I’ve put the ‘L’ in losing since 1965. I’m not a “super-apostle” or an uber-Christian. I’m an ordinary guy with an extra-ordinary calling. But that doesn’t mean I’ll be successful in all I put my hand to. Good people, people of faith, fail just as others do. The difference is that when they fail, they do not fall, because they return to the Lord in repentance, calling on his name and seeking forgiveness. So, what do you do when you fail? Do you give up or get back up? Don’t beat yourself up, but recognize that Jesus was beaten (and crucified) for all your sin and failure. Get up, and get going just as if God has made all things right (because, well, He has in Christ). For me it was unthinkable for the Celtics to lose to the Hawks, again. Well, it was nearly unthinkable for the Sox to be swept by the Rays, and that happened. But the Celtics had dominated the Hawks this season, and in the first 2 playoff games. The Hawks looked utterly horrible! Game 3 was different. It was like a completely different team showed up. The Hawks could apparently do no wrong. This despite working in a bargain basement setting. In the second half one of the shot clocks on the goal post didn’t work. So they turned both off and had the announcer say “10, 5, 4, 3, 2, 1” and a whistle indicated that time had elapsed. Surely, I thought they Celtics would figure out their defensive rotations, the technical crew would fix the shot clock and the Hawks would regress to the mean of mediocrity. Well, the shot clock worked. But the buzzer didn’t so they time keeper used an air horn. What is this, Middle School? David Stern, who was there, had to be cringing since this was part of the national TV doubleheader. Doc helped the Hawks with some strange rotations. In a time when they needed a lockdown defender, Eddie House was in there instead of Tony Allen or James Posey. Huh????? This helped former Celtic Joe Johnson do his best Michael Jordan impersonation and totally dominate the 4th quarter so the Celtics actually LOSE. Arrrggghhh! Worse, ESPN keeps playing the little scrum that erupted. 2 players (Perkins and Marvin Williams) left the bench area and might have to sit for game 5. 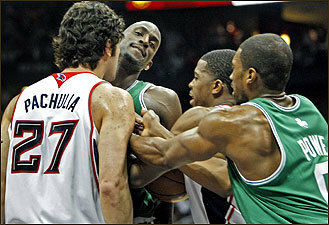 KG was going ballistic, so focused on Pachulia that he flicked the ref off of him. Since the ref didn’t toss him, I’m hoping that the league doesn’t decide to help the Hawks some more by tossing KG for a game or 2. Of course they fined Pierce for making a gesture that they claim is a gang symbol. Looks more like flicking something off your finger or going “okay”. I don’t know. Apparently it means “blood, sweat and tears” and he does it at the beginning of every game. So, this series should be over, or at least on the verge of being over. Yet, we are tied with a far inferior team. Welcome to the joys of the playoffs. Now, can the Celtics make the necessary adjustments? Will they continue to give Bibby wide open looks? Will they lose players for Game 5? Have they noticed that the Magic finally WON a playoff series (it’s been more than a decade folks)? It was a jam packed weekend filled with fun and frustration. It is fun hearing that you don’t have any cavities! It is also fun trying to teach my daughter how to cut paper with her new scissors. She still uses both hands to open it, and wants to hold them at an odd angle. Yes, it will take time. But it was fun. Frustration? I was certainly frustrated with the same daughter was angry with me because I didn’t want her walking around with the blade unit from the Magic Bullet. She can’t grasp that I’m trying to protect her from potentially dangerous situations. All she knows is that I’m blocking her pursuit of fun. It also was frustrating not being able to find a gender-neutral scooter for my kids at the W-M.
Fun was watching my son play with his new cars. A neighbor gave him the Cars collection. He really enjoys playing with them- captivated really. And he has not seen the movie. Fun was watching him pretend to throw a baseball. I had the Sox-Rays game on and he was mimicking the pitcher. It was even funnier looking when I put his arm restraints back on. He seemed captivated by baseball this weekend. And boxing. We were at a friend’s house. They were showing part of the Ali-Ernie Shaver fight, and his eyes were glued to the TV. Thankfully he wasn’t practicing with his arm restraints on this time. Frustrating was having CavWife ask anytime I either had been or was going to be near a computer and wanting me check on the progress of the laptop. I kept forgetting. We were both frustrated. Even more frustrating was watching the Sox get swept by the Rays (who have a very good team this year). Why? Try no off days in 3 weeks and fending off the bug. They were worn out and wasted 2 superior pitching performances by Buchholz and Beckett. Beckett’s 13 Ks meant an extra point for my fantasy team which remains in first place at this VERY early juncture. I was also frustrated with watching the Hawks play an amazing game to beat the Celtics. CavWife is not sure why the NFL draft is a big deal. I’m not sure why anyone would spend all day watching it, much less heading to Radio City Music Hall. I did check in periodically to see how the Patriots were doing. Some people watch to see where players from their favorite college teams and alma maters go. My alma mater, Boston University, no longer has a football team and so my efforts to see one of them drafter were in vain. I can’t remember the last Terrier drafted in football or basketball. Hockey is a different story. I think the Patriots addressed their most pressing needs (youth and speed at linebacker and cornerback). But who’s to say at this point? Our study of 1 Peter wrapped up chapter 2 Sunday night. Our group is in transition. The youth pastor will soon have to take over the youth study since the intern is graduating and moving on. My long-term status in up in the air. So we aren’t sure if the group will be able to continue come the Fall. Someone would have to step up. Today I took our son to one of his post-surgical appointments. We arrived early since you can’t predict the traffic into Orlando. We enjoyed a walk around a nearby park. He enjoyed the fountains and the water fowls. We saw a group of ducks that included 8-9 ducklings. We also saw a good sized turtle swimming around in the pond. I like sharing those moments with him. So much better than the wet bedding (an unfortunate result of the liquid diet he’s been on since the surgery). The surgeon was quite pleased with the repair on the lip. He thought the palate was looking much better. We were rinsing it when we should have been irrigating it. The white spot I feared was a hole or exposed bone is only a scab (huge sigh of relief). He should only wear the arm restraints for another week. Once the stitches fall out we no longer have to irrigate. All in all- a very good report from the surgeon. I did discover that the reason all the skin was peeling off of his thumb was that in the restraints he couldn’t put it in his mouth. So it dried out, really dried out. I finally remembered to check the progress of the laptop. Still in the repair process (sigh) so no pictures of the family or the animals we have seen. I’m not sure how much I’ll be able to post in the next week or so. Yesterday I went to Presbytery. Between where I am cicumstance-wise and some decisions made, I’m pretty discouraged. I’m not excited abou the direction our Presbytery seems to be moving. I’ll leave it at that. On the way home I dropped the laptop off for the Geek Squad to try and fix the problem with the screen, again. It intermitently goes blank, like there is a short. We need to fix this before the extended warrentee goes the way of all flesh. But this means I can’t go on-line at home. Office time is a bit infrequent right now as family responsibilities take up some time. Today CavWife brings the boy to the surgeon’s office for his post-op check-up. His stitches will be removed. We are concerned that there seems to be a “valley” on one side of his palate. I will stay home with the girl, listening to her pound on the wall as she rocks instead of naps. I may try to watch The Simpsons Movie again before returning it to its rightful owner. Or I may sit outside and prepare for the Family Study as we wrap up 1 Peter 2. I am excited about how well the Red Sox are playing right now. This despite the missed starts by Beckett and Papi slump (which is over thankfully), Lowell’s injury and shaky starts by Lester and Buchholz. Ellsbury and Papi are helping the cause of dominating my fantasy baseball league. Congrats to KG for getting some of the recognition he deserves for making the Celtics one of the best defensive teams, which transformed them into a winning team. To watch them in the playoffs, expecting them to win, is a feeling I have not had since the late 80’s. And I’m loving it! The Bruins at least made a series out of it with Montreal. I expected the Canadians to sweep them. I was pleasantly surprised. The downfall of Game 7 was losing their aggressiveness. They seemed more reactive than proactive so the Canadians just walked away with the game. Or perhaps skated away. The girl is currently getting her first experience of Rossini here in the office. She seems to enjoy it despite the fact it has no lyrics (on this CD). I have to bring her home now. 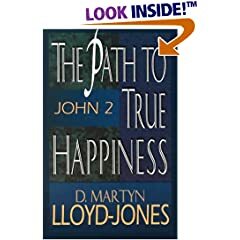 I got back to my reading of The Path to True Happiness by D. Martyn Lloyd-Jones this afternoon. He was talking about when Jesus cleansed the Temple in John 2. He used this to address the church’s relationship to the state. When this becomes confused, the church loses its real power and the whole nation suffers. Interesting words as much of America, including our President, celebrated the visit of the Pope. Popes seem to know how to do little else but speak to world leaders. Sorry, but hugging a sexual abuse victim when the Church of Rome has allowed this sin to fester unhindered for decades is ample evidence of what church’s should not do. The point: churches lose their moral authority to speak to society if they are not addressing the sin in their own communities first and foremost. Lloyd-Jones had watched the church in England forfeit its voice for decades. He was frustrated with a holy frustration. For it is the tragedy of the hour that the church is telling the world what to do when the question is: Is the church in a fit condition to do so? I suggest that it is not surprising that the world does not listen. But the moment there was a declension in the temple worship, deterioration invariably followed in the life of the people: like priests, like people. … Take another verse: ‘Righteousness exalts a nation (Proverbs 14:34). Not possessions, not wealth, not material power, but ‘righteousness.’ … When things go wrong in the Temple they will go wrong everywhere. The key to everything is our relationship to God. The Doctor is not blaming “those damned heathens” for the moral ills of his society, and neither should we. He blamed the church because she had not lived up to her calling which opens the door to rebellion based on hypocrisy. A vibrant church, which is pursuing righteousness, will change the shape of a nation far more than preaching against the ills of that nation. Well so often in Israel the first thing that went wrong when they lost the living Spirit was that they turned the temple worship into something formal and external. … The formalizing and externalizing of religion is a great curse. We know some of this here in America. Our churches have been infiltrated by materialism and consumerism (the whore of Babylon). We pursue success and access, not righteousness. We condemn non-Christians instead of applying the gospel to our own wicked hearts. Often our churches are used by the political parties to further their agenda (this happens on both sides of the aisle, folks). The problem is not the political parties, but the pastors and denominational leaders that bow down to them and fail to protect the flock. The need is not for something to happen in the state, but for something to happen in the church. Why are the statesmen ignoring the church? Because the church has no power (he means spiritual power). … if you and I are genuinely concerned about the world and its state, our first duty is to pray for revival in the church. It is not to say things to the world, but to seek this power which will enable us to speak to the world in such a manner that it will tremble as it listens to us. The business of the church is to bring men and women to God and to keep them in communion with him. The church should be filled with such power from God that everybody, in a sense, will be forced to listen. … The first prayer is to plead with him to come into his Temple, to manifest his glory, to show us something of the might of his power and to fill us with that power. May King Jesus do just that, manifesting His glory in a people being transformed by grace. As His church becomes healthier and exhibits spiritual power more will be converted and transformed, thus changing the character of cities, counties, states, regions and a nation.